A senior Iranian military commander on Wednesday said the Islamic Republic would "welcome war with the U.S." and "set fire to every military base from which a hostile U.S. plane takes off," according to reports in Iran’s state-controlled media. 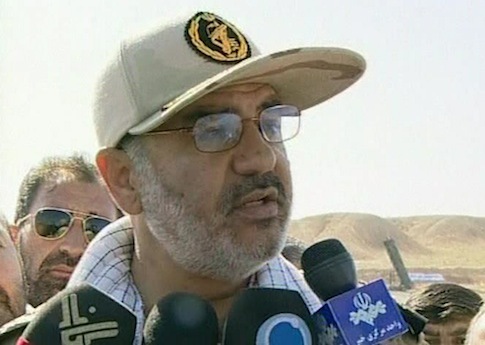 Iranian Revolutionary Guard Corps (IRGC) Commander Hossein Salami threatened the U.S. during a television interview aired on Tehran’s state-run television. "We have prepared ourselves for the most dangerous scenarios and this is no big deal and is simple to digest for us; we welcome war with the U.S. as we do believe that it will be the scene for our success to display the real potentials of our power," Salami was quoted as saying by the Fars News Agency. The remarks came as Secretary of State John Kerry and several lawmakers met with Israeli leaders this week to discuss the Iranian threat. Salami, according to Fars, "warned that Tehran will set fire to every military base from which a hostile US plane takes off for bombing Iran." "We warn their pilots that their first flight (to target Iran) will be their last one and no one will be allowed to go back safe and sound and they should call their flights as their last flight," the IRGC leader was quoted as saying.